2 Autogramme, 1 One Film Card, 1 Chase Insert Card und 1 2014 Draft Exchange Card per Box !! 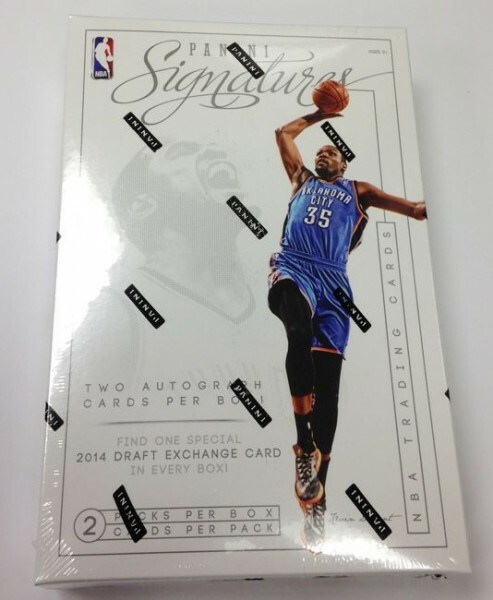 Produktinformationen "2013/14 Panini Signatures Basketball Hobby Box NBA"
Factory Sealed 2013/14 Panini Signatures Basketball Hobby Box mit 2 Packs a 2 Cards per Pack. Find special Exchange Cards for the highly touted 2014 NBA Draft Class! Look for rare Film Rookies Autographs from 25 of the NBA's hottest first year players! Check out seven new Autograph Inserts, including History of the Hall Autographs and Franchise Graphs! Pull some of the rarest chase cards, all of which are #'d/25 or less! Weiterführende Links zu "2013/14 Panini Signatures Basketball Hobby Box NBA"
Fanbewertungen für "2013/14 Panini Signatures Basketball Hobby Box NBA"